Heading to Israel for not one but TWO close friends’ weddings, I needed to find a place to stay in notoriously expensive Tel Aviv. Ran hasn’t lived in his home country for almost a decade, so he was little help in recommending a good hotel. 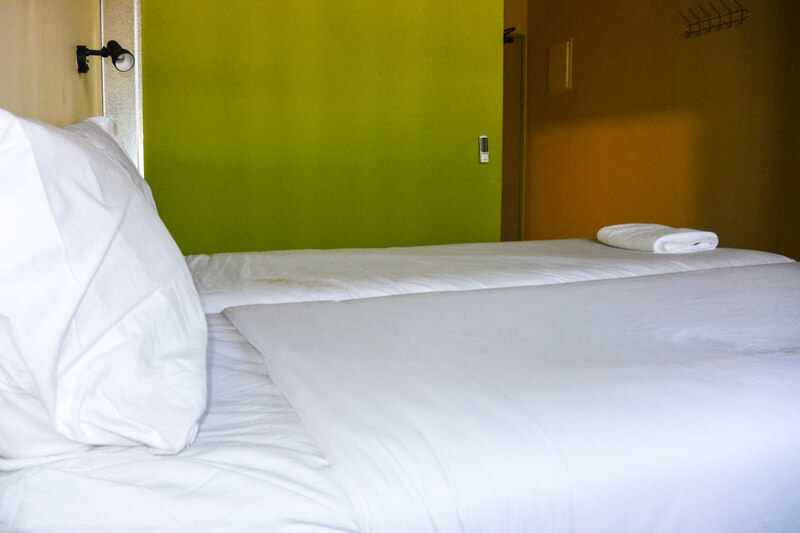 Which was fine by me – I love accommodation research! 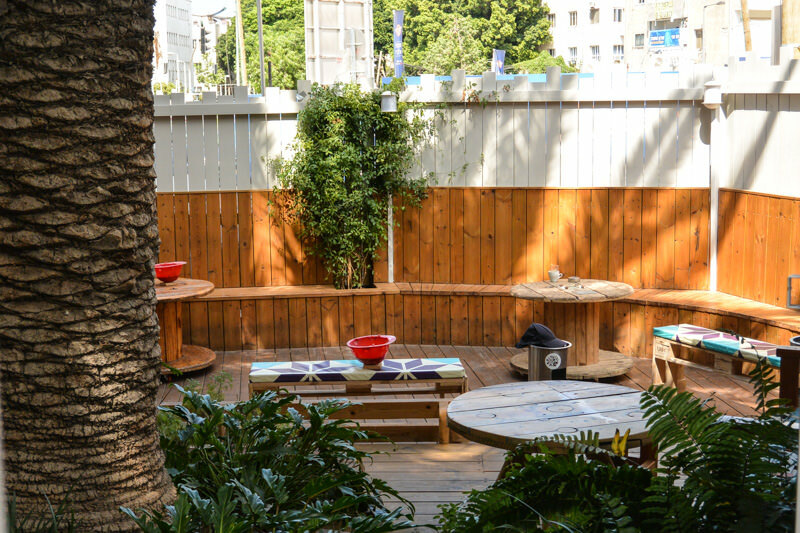 While I sampled a few places to stay in Tel Aviv, none where as cheap OR as fabulous as Abraham Hostel. It is super rare and super awesome when an inexpensive price coincides with the highest quality – and this awesome combo should be celebrated! 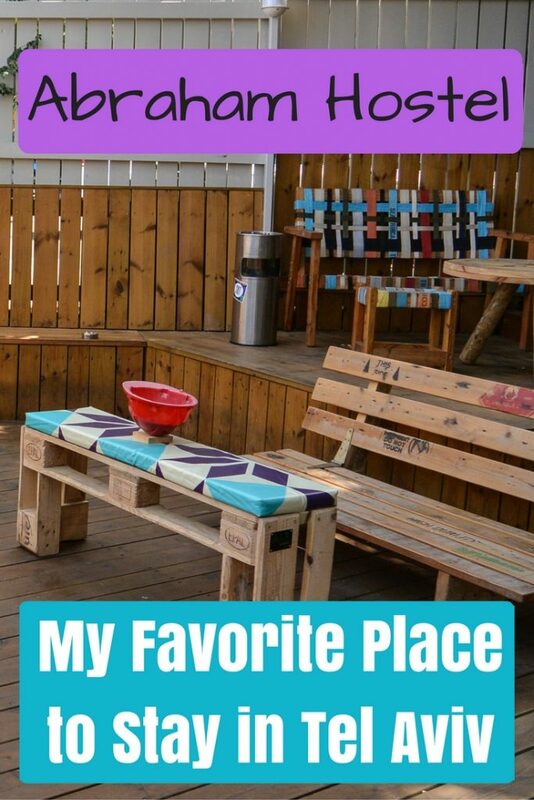 I’ve stayed in some great hostels in the past (like Room2Board in Jaco, Costa Rica had a pool and waterslide) – but I’ve definitely found a new favorite. Abraham Hostel is fun and funky, with bright light (most of it natural) and even brighter colors. The vibe is definitely welcoming and open, with lots of shared spaces, and you can feel it as soon as you enter. 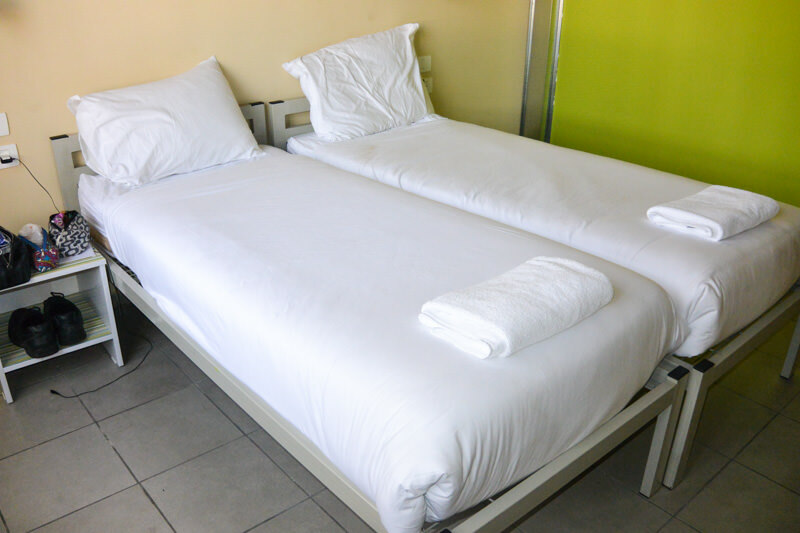 I love hostels (for their price and their community feeling) but as I’m in my late twenties, no longer hard-partying, and sometimes traveling as a couple, I don’t always feel that they’re a good fit for me. Let’s be honest, I like my sleep! Abraham Hostel was a major exception. I saw all kinds of guests making Abraham their temporary home, from families (with young children, and with older) to couples to young single people, which was really refreshing. Abraham perfect nails the intersection of family friendly and fun, without being frumpy. 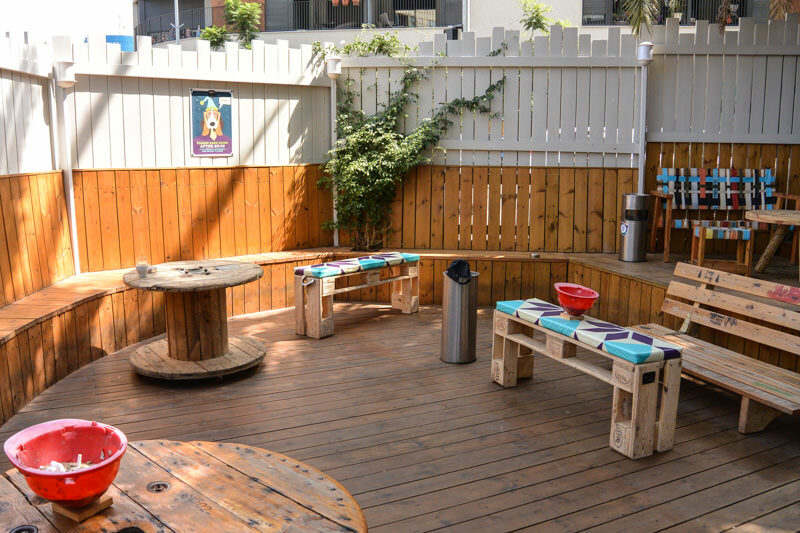 While most hostels have a tendency to be a bit cramped (maybe for profit reasons, trying to fit as many rooms into a space and keep prices as low as possible), Abraham Hostel felt more like a design hotel. The huge high ceilings and ample space felt very modern, with more of a focus on enjoyment than utilitarianism (though still very functional). The free breakfast was a major highlight, especially in expensive Tel Aviv. 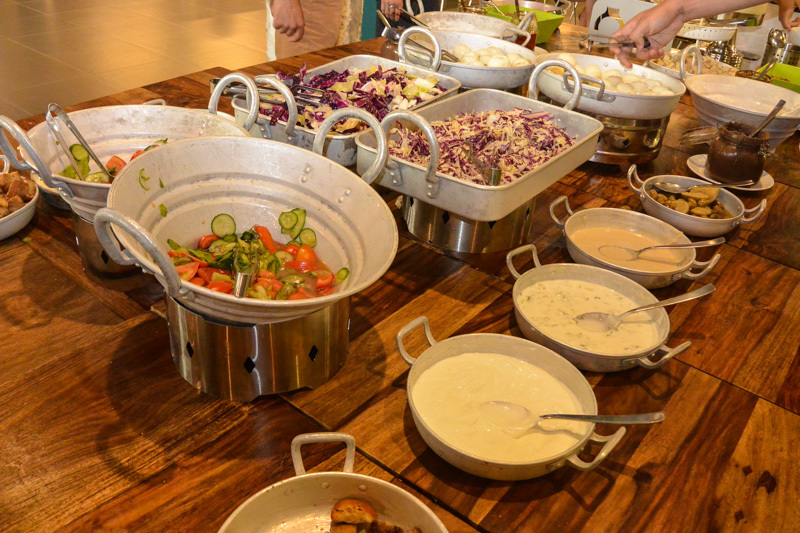 There were tons of vegan and vegetarian options, with hummus, other dips, salad, and bread. One thing to keep in mind is that the breakfast and the dish washing are both self service, so it’s best to go early and avoid a traffic jam if you have plans right after breakfast. The kitchen area where breakfast is served is absolutely unreal, and the best by far of any hostel I’ve stayed in. It is fully stocked like your kitchen at home, with standard far (utensils, plats, bowls), but also sharp knives for salads, and even WINE GLASSES! 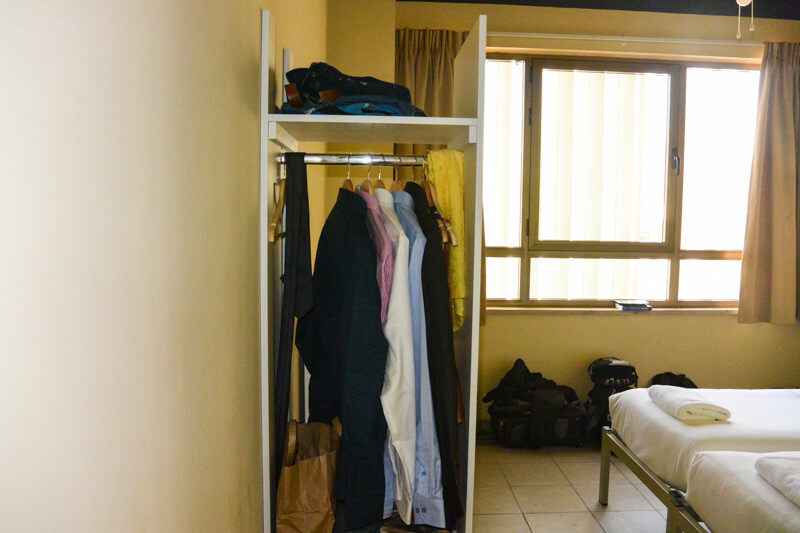 Even better, you can bring everything back to your room (also equipped with a fridge), if you’re a disgusting bed-snacking sloth like us. The rooms were amazing, for snacking, for sleeping, and even for hanging out. Huge tall windows let in a lot of light, and the rooms themselves are ginormous. 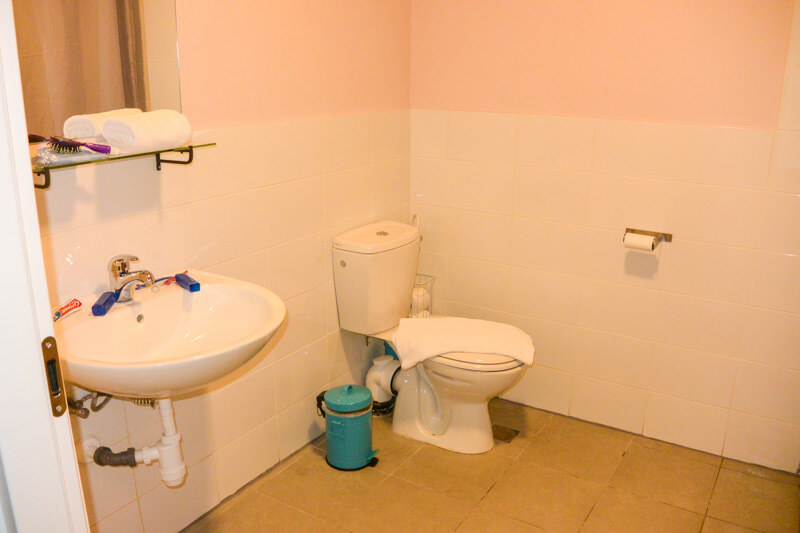 The room was cleaned each day, and new towels distributed. Luckily, there was a lot of storage space. The open-air “closet” was perfect for our fancy wedding duds! 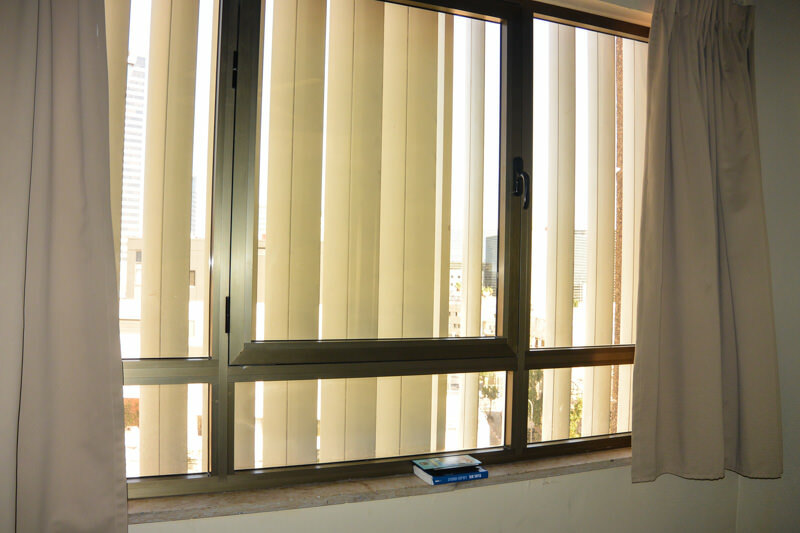 After a long day of wandering around Tel Aviv, the AC was absolutely kicking, and after a long night of wedding partying like we were doing, the beds were ridiculously comfortable. Definitely top 5 most comfortable hostel or hotel bed I’ve ever experienced. The location of the hostel itself is amazing, near to AM/PM for groceries, tons of restaurants (including my breakfast favorite Max Brenner), and walking distance to the beach and market. I can’t say enough about the staff. They were super helpful and friendly (and everybody spoke perfect English), handing out maps, calling cabs, and just doling out advice (even on where to get a manicure). Stop by the tour desk if you’re wondering about possible activities in the city, they’ve got a full schedule on offer each day. A unique perk I’ve never seen offered at a hostel but that I’ll definitely take advantage of next time: free shuttles between locations, or even from the airport if booking for 3 nights. Transport in Israel is super expensive, and the free shuttle is an a amazing value, and probably pays for the expense of the room in itself. All in all, Abraham Hostel is better than any other hotel I could find and try, even compared to hotels at double the price. My only gripe? While it says online that they offer a blow dryer, definitely just bring your own. The first time I needed it, the blow dryer was available (there’s only one). But the second time, someone had it for over an hour and a half by the time I just gave up and went au natural. The front desk doesn’t track who has it, so they couldn’t go ask for it back. That’s a pretty silly and small thing, unless you’re going to a major event and will be photographed all night with icky hair (like I was). 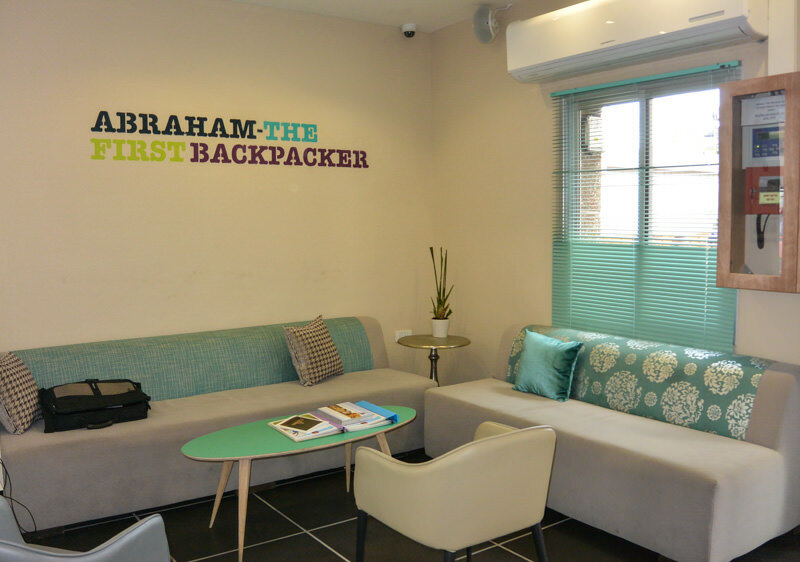 While I was a guest of Abraham Hostels, I was not obligated to write a positive review. All of the raving and love remains 100% me. 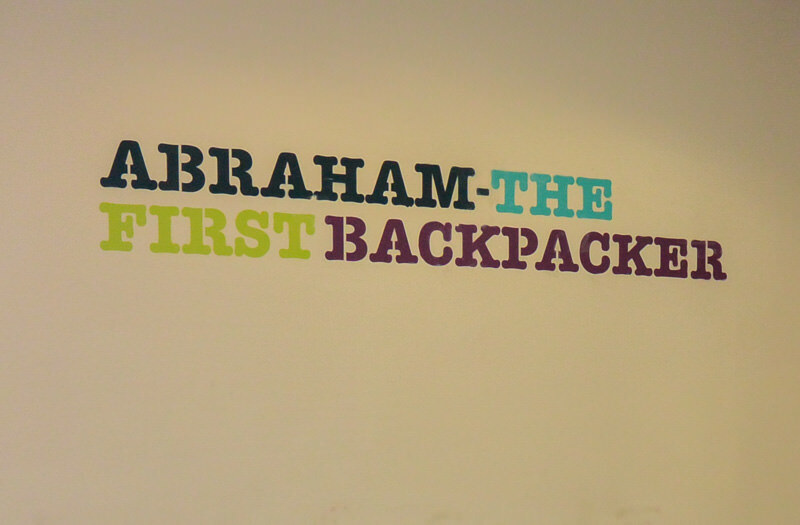 I go back to Israel about once a year, and I will ALWAYS stay at Abraham Hostel when in Tel Aviv. Previous Post The Only Athletic Shoe I’ll Pack. Ever. Again. Staying at Abraham Hostel in June. This was very informative! Thank you!! !